Scarce early map of the Falkland Islands or Islas Malvinas. 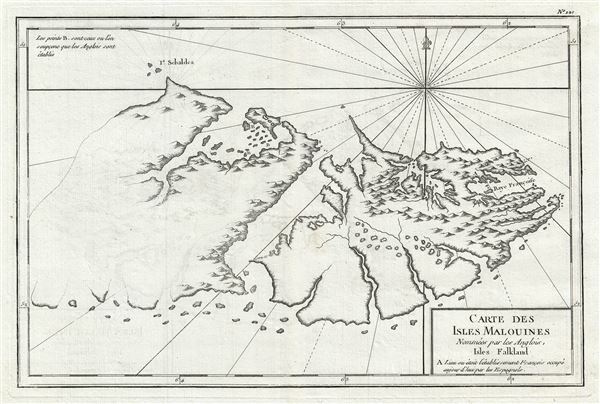 Carte des isles Malouines nommees par les Anglois, Isles Falkland. An exceptional 1787 map of the Falkland Islands or Isles Malvinas issued by Etienne Andre Philippe de Pretot. The map covers the East Falkland in some detail and the eastern parts of West Falkland. The western parts of West Falkland are ghosted in or not addressed at all - evidence of only tenuous exploration. The map identifies the Isles Scbaldes and a French settlement on Baye Francoise (East Island). Three 'B's near modern day Whale Bay most likely represent early British settlements or at least natural harbors used by British navigators for shelter and provisioning. The cartography for this chart was mostly likely based upon the discoveries of the French explorer Louis-Antoine de Bougainville's, in whose 1771 narrative an earlier version of this cartography appeared. Bougainville established Port St. Louis, the first recorded settlement in the Falkland Islands - identified here with a small cross. The French knew of these islands from about the 1720s when ships out of St. Malo provisioned here before sailing around Cape Horn and into the Pacific. It is from 'Malo' that the French name of the Falklands, Malouines, is derived. The modern day Spanish name, Malvinas, is a translation of the original French name. This map was published in Etienne Andre Philippe de Pretot's 1787 Atlas Universel. It is exceptionally scarce and rarely appears on the market. Our research identifies only 4 examples offered in the last 30 years. Etienne Andre Philippe de Pretot (1710 - March 6, 1787) was a French schoolmaster and geographer active in the middle part of the 18th century. Pretot was a member of the Academies de Rouen and d'Angers. This corpus includes various publications on history, cosmography, and geography. Little else, unfortunately, is known of his life. Philippe de Pretot, E. A.,Atlas Universel pour l'Etude de la Geographie et de l'histoire Ancienne et Moderne, (Paris) 1787. Very good near fine. Platemark visible. Blank on verso. Original centerfold. Fordham, A., 'Falkland Islands A bibliography of 50 examples of printed maps bearing specific reference to the Falkland Islands. ', Map Collector's Circle, No. 11, Volume 2, item number 18.